I have no idea how it happened, but Thanksgiving is almost here! The year has flown by and we’re coming into the holiday season. Thanksgiving might be one of my favorite holidays. I love spending time with family, cooking up a storm, and enjoying all the special occasion foods. Plus, there’s all the Thanksgiving leftovers! After a couple meals of mashed potatoes and gravy, I like to get creative with the leftover turkey. 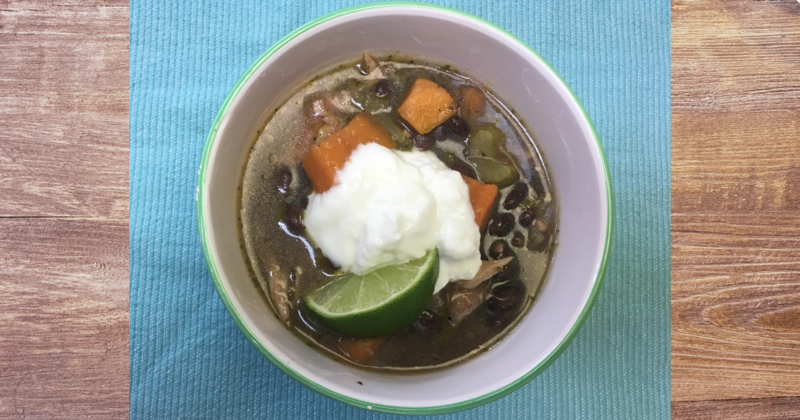 My favorite recipe is Black Bean, Sweet Potato, and Turkey Soup. This recipe is a great way to revamp your leftover turkey and take a break from the classic Thanksgiving flavors. Sweet potatoes and black beans combine with cumin, green chiles, and lime for a smokey and spicy dinner. It was a crowd pleaser from the start. All three kids ate dinner with no complaints, but the flavors were complex enough to satisfy the grownups. 3) Dice celery and add to pot. Saute until both veggies are lightly browned. 4) Add stock, sweet potatoes, oregano, cumin, and spices. Simmer until sweet potatoes are tender, about 40 minutes. 5) Add beans, turkey, and chiles. Simmer 5 minutes, or until you’re ready to eat! 6) Serve with yogurt and lime. This recipe is a low fat powerhouse of protein and fiber, perfect for fueling up after a long day of post Thanksgiving hiking or Black Friday shopping. If you’re using homemade stock, you might end up with a little more fat, but we’re only using 1Tbsp of olive oil. Plus, between the sweet potatoes and the celery we have a couple different veggie colors. I tend to go lighter on the red pepper flakes and let people add more if they want. Don’t be afraid to include them, though. The yogurt and lime really cool the spice profile of this meal. I just can’t say enough about the flavor profile of this soup. The sweet potato and lime play perfectly off the green chiles and red pepper. If you can get your hands on smoked turkey, it makes the soup incredible! I usually serve this with a cheese quesadilla or a few tortilla chips for my kids. My kids don’t usually enjoy leftovers, they actually got excited to eat this soup again! They enjoyed swirling the yogurt through their soup and squeezing the lime. If you’ve never made your own stock, give it a try! I just put whatever turkey bones I have in a large pot or Dutch oven and cover with water. I simmer it until the house smells amazing and any meat starts to fall off the bone. The trickiest part is straining it. Put a colander in your biggest heatproof bowl and slowly pour the entire pot through. I always spill a little, but it’s worth it. This is also a great way to use up the last of a rotisserie chicken!